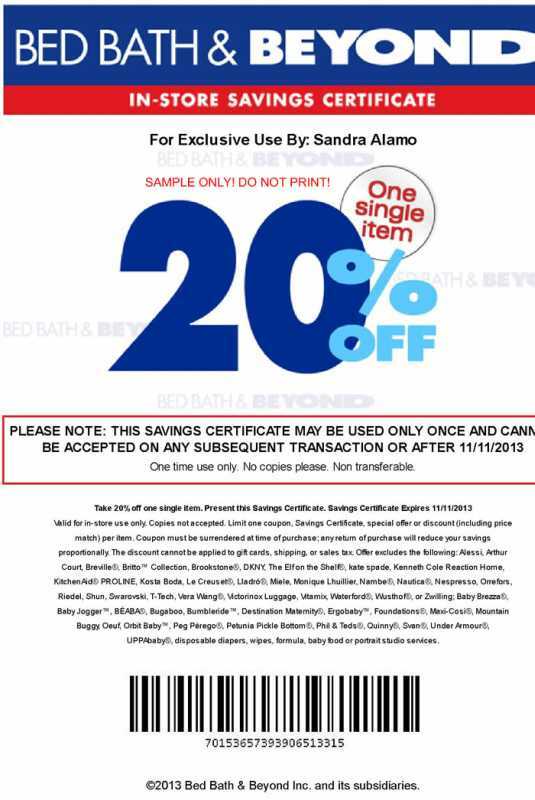 A lot of people have complained to me that they do not receive the 20% off a single item bed bath and beyond coupon after they have signed up for the newsletter. I have put together this step-by-step guide with pictures and offer tips to help you through the process of getting these valuable savings certificates. Follow the guide and tips below and I guarantee that a coupon will be emailed to you. 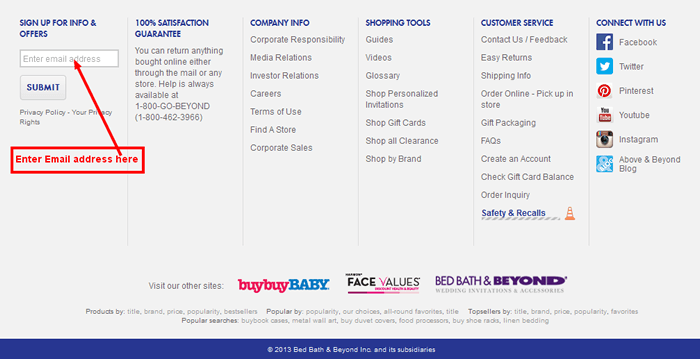 Go to www.bedbathandbeyond.com. Scroll down to the bottom of the page and enter your email address in the space indicated in the picture below and click the “submit” button. Tip: Enter an email address you have not used in the past to sign up for a bed bath and beyond coupon. If you enter an email address you have used in the past, you will not receive a new savings certificate. If you don’t have another email address, create a new one or use a family member’s email address. A new pop-up window will open that looks like the one in the picture below. Fill in the required information. 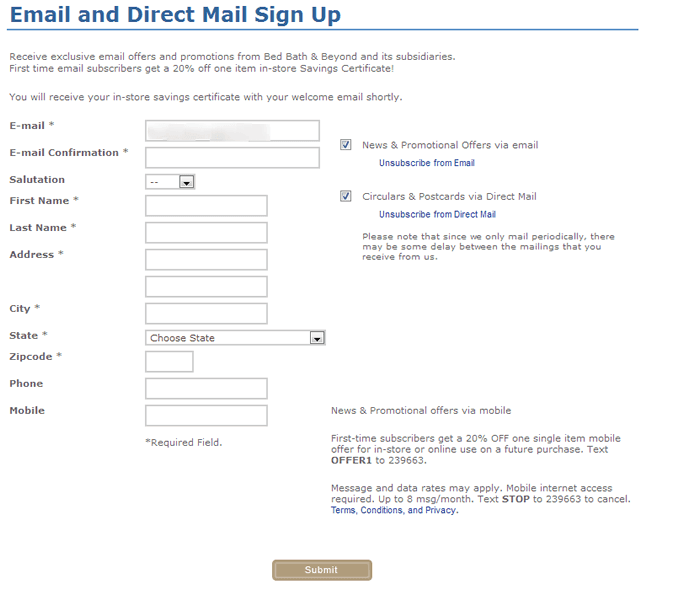 Make sure the “News & Promotional Offers via email” box is checked. If you want to receive coupons and circulars sent through snail mail, make sure you check the “Circulars & Postcards via Direct Mail” box as well. Complete the form and click on the “submit” button. Tip: If you have already completed this form in the past with your own information, you might not receive a savings certificate. In this case you can fill the form with an imaginary address information and uncheck the box that says “Circulars & Postcards via Direct Mail” so as not to send unsolicited mail to that address. Tip: If you cannot find the email from bed bath and beyond, look into your spam folder. Your spam filter might have sent the email there. For those using gmail and other mail services that automatically group your emails, look under the “promotions tab” to find the email. Open the email. It should look like the one in the image below. Some email services do not display images automatically. In this case you need to click on display images to show the images in the email. Click on the link as shown in the image below to go to print your 20% off coupon. Tip: Your email provider may disable images in emails. If the email you receive from bed bath and beyond does not look like the one above, make sure to enable images in order to see the full message. On clicking the above link, you are taking to a page like the one below. Click on the “click here to print your savings certificate button” to print the coupon. You need a printer to complete this step. And bingo! You have a 20% off a single item like the one below which I just printed. Please do not print the image below as it is only meant as a sample and will not be honored by stores. Tips: This guide is only for obtaining coupons through the bedbathandbeyon.com website. These coupons are officially known as savings certificates and valid for in-store use only. If you checked the box that says “Circulars & Postcards via Direct Mail”, you will from time to time receive snail mail coupons and circulars and this might just contain a 20% off entire purchase coupons. If you have any further question or requests, leave a comment below and don’t forget to share this with your friends and readers.